Yesterday it snowed lightly throughout the morning and with sub optimal visibility it was definitely a day for the trees. The previous day we had gone up the Midi in the morning window to find the snow trashed by the wind and slabs everywhere. After successfully navigating the hazards on the first 3 pitches of Grand Envers we traversed off above the Requin to the Salle a Manger to avoid more windslabs and stress. The trees provided awesome skiing and we harvested the area we were in each time taking the fresh line adjacent to the previous one. Pillows, spines, gullies, trees were all skiing Alaska style, we were having so much fun, still taking care to ski one at a time on the steeper pitches and stand on spurs/safe points. 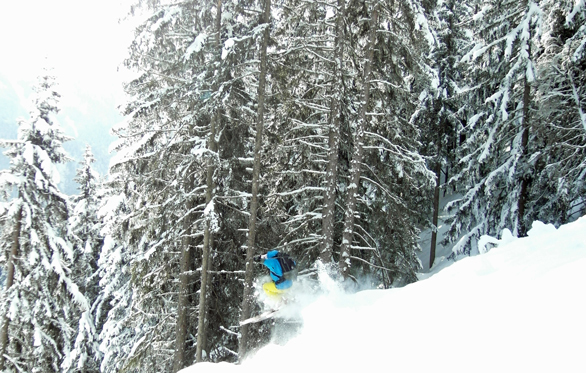 The final run was down a drainage line with a steep entry traversing through thick trees. Once in the gully itself the angle eased off alot and we skied more one pitch maintaining usual discipline. As the angle eased below 30 degrees I was having fun and skied past the others and continued down the couloir for about a kilometre, skiing fast, drifting the turns, launching off spurs and enjoying the playful nature of my skis. About 200 m from the bottom I glanced over my shoulder one final time to check the slough and glimpsed a powder avalanche ripping down the line about 100 m behind me closing fast, so I cut out left into the trees. The snow was very light and cold and we’d already witnessed the trees drop snow which had set sloughs running, and my own slough could have easily gone airborne in these conditions. I didn’t think much off it as I waited for the others and Philip soon called out from above. I assumed he was just checking I was below and hadn’t veered off into new territory but he then called my phone with the news that he had been caught in a powder lanch, pulling his airbag, smashing off a few trees before coming to a rest ontop, his skis gone. Paul had also been caught and buried up to his chest. Initially it was a major worry for Philip that everyone had been caught but as the girls descended from above everyone was soon accounted for and the group were all ok. As I waited for them to descend towards me 2 young lads came down and stopped in bed of the couloir. I called them over and explained an airborne lanch had come through here which didn’t seem to register with them. Asking if they had seen my friends they confirmed they had skied past the carnage without noting what was going on. Neither had Arvas or backpacks. As my friends joined me the 2 lads offered to go back up and sweep the line as they had noted one of Philip’s skis javelined in above. Trying to explain that they should have transceiver,shovel, probs seemed to be lost on them as they went for another lap promising to return Philip’s ski if they saw it. We needed to get down to safety quickly before everyone got really cold. Before heading off we saw a snowboarder bimbling past, looking out of place in the terrain, and uncovering one of Philip’s poles without noticing. It had carried some 500 m in the blast and dropped out of the aerosol just next to me. Afterwards in town we enjoyed a big beer and food in Elevation and talked alot about what happened. It became clear that Paul had been caught in the slough which had gone airborn by the time it hit Philip like an express train further below. 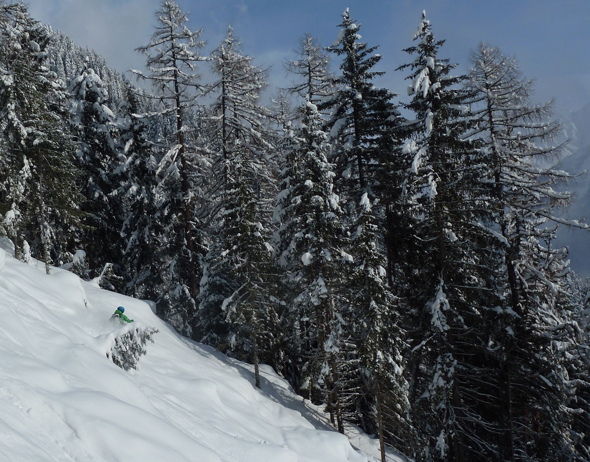 Bearing in mind the avalanche forecast was 2/5 with chance of slabs near cols and ridges, our choice of ski area with no ground above, in the trees, and below 2000 m where the wind hadn’t effected the snow seemed to be a prudent one. Total snowfall for the previous 24 hrs was probably starting to reach the 15/20 cm. Were the 2 other skiers a factor? Could we have reduced our exposure time further? Who knows, as with all accidents there are always factors that went unconsidered, all I will say as that I chose to go back skiing the same area today knowing it was one of the safer areas rather than being up high or on big open faces that many ripped up today with the windslabs now hidden under the fresh snow. From a risk perspective its interesting for me to come from a desk job where I get a rap on the back of the hand if I don’t put a lid on a coffee cup or hold the hand rail on the stairs, to Chamonix living where slowly your perceptions change. At the end of the day when the skiing is world class with lots of slough to manage there is risk and whether you choose to accept those risks is up to the individual. Good thoughtful piece Rossco. Benefit/Risk management at it’s best! Or maybe its worst with those other lads. Did Phil get his skis back?